One of the biggest beer developments of the past 12 months is this: Walmart now sells its own “craft” beer. Go ahead and laugh. I’m assuming most beer lovers don’t spend much time thinking about the craft ales and lagers in the cooler at Walmart, especially if the selection is as mediocre as the one at my local D.C. store, where the few sixers and sampler 12-packs of Flying Dog, New Belgium and Dogfish Head are dwarfed by 30-packs of Natural Light and Tecate. But market research firm Placed Insights ranks Walmart as the most popular store in the country, with more than half of all American shoppers visiting one of the company’s 4,600 stores in a given month. That’s a lot of eyes falling on those products. Teresa Budd, a senior buyer for Walmart’s adult beverage team, says the company began to notice its craft beer sales growing a few years ago, especially compared with sales of mainstream domestic beers. 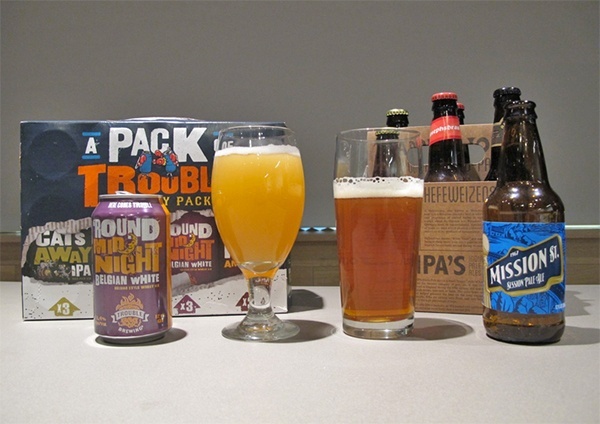 The company put out an offer to suppliers around the country, seeking to produce an IPA, a pale ale, an amber ale and a Belgian-style ale, Budd says, because “those were the top four best-selling craft styles at the time.” After samplings and tastings, “making sure it’s exactly what we want,” Walmart began producing beer in “collaboration” with a company called Trouble Brewing in Rochester, N.Y.
Read the full Washington-Post story here.